I'd really like to meet the guy who bought that brand new 16GB Apple iPod for $2.49 at an online auction site. Maybe he'll sell it to me for five dollars. Sites like Beezid, QuiBids, and DealDash offer popular products for prices that just don't seem possible. But the sellers are definitely making money on these deals. Here's how penny auctions, also known as bidding fee auctions, operate. In a traditional online auction at a site like eBay, it's free to bid, and the price of the item goes up as people try to outbid each other. Most of the time, the winner of the auction pays a price that's reasonably close to the value of the item, due to competition and rational bidding. The "losers" pay nothing, and get nothing. It's a pretty simple and fair model. In a penny auction, opening prices are set unusually low, whetting the potential buyer's appetite for a bargain. A non-refundable fee is charged for the privilege of placing a bid. Each new high bid raises the going price by a small amount – often a penny, although it may be more. Each new high bid also extends the ending time of the auction by a few seconds, giving others an opportunity to outbid the high bidder. The auction ends when its ending time passes without a new bid. It’s entirely possible to spend more money on bids than on the item you win. But all you will see when you look at penny auction histories are the low opening prices and the relatively low winning bids. You don’t see how much the winners spent on bid fees. The lack of this hidden information misleads people into believing that they can get fantastic bargains. Here's a simplified example of a penny auction for a laptop that retails for $1000. 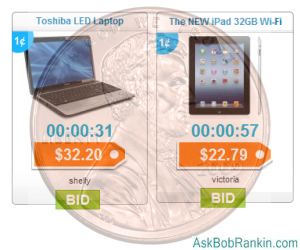 You have a group of bidders, each paying a dollar to place a bid, and every bid raises the price of the item by a penny. If the winning bidder placed 60 bids, and the final price of the auction was $50, he or she would pay a total of $110 for the laptop, and save $890. What a deal! But what about all the bids placed by the other hopeful bidders? Well, a final price of $50 means a total of 5000 bids were placed. So the seller (probably the auction site) gets $5050, minus the $1000 cost of the laptop, or a profit of $4050. The bottom line: one lucky winning buyer, one seller with an enormous profit, and lots of losing bidders, many of whom paid $30, $40, or $50, and got nothing. Most people like to keep their purchases simple. Tell me what a product costs and I’ll decide whether I want to pay the price. But some people want to save money so badly that they’ll endure more complexity, like bidding on an auction item repeatedly. A few are so cost-conscious that they’ll pay for the mere hope of saving money AND endure the complexities of an auction. That last group is the most susceptible to fraud because their greed blinds them to reality. Penny auctions take advantage of greed. It is possible, in theory, to get a fantastic bargain if a) the bid fee is low and b) you bid rationally. Place one bid that represents the highest amount you are willing to pay for the item; then ignore the auction until it ends. If you win, great; if not, look for another opportunity. But many penny auction systems are rigged so that you will never win by bidding rationally. Some penny auction sites make participants buy bundles of bids for a relatively high price, e. g., 100 bids for $50. You start out in the hole, and the only way to get ahead is to keep bidding. The site wants you to keep bidding because that drives up the winning bid. In a way, participating in a penny auction is like gambling. You repeatedly put up a small sum of money, in the hopes of winning a big payoff, at odds that favor the house. The irony is the odds are probably better in Vegas than at a penny auction. Shill bidding also happens, and is sometimes automated. You place a high bid and almost instantly, someone else outbids you. Your competition works for the seller; the competitor may even be a software program or “bidbot.” If you succumb to “bidding frenzy” in an effort to win the item, you will end up paying whatever the seller wants you to pay. If you don’t win against a shill, you are still out the cost of the bid fees. If you do buy into a penny auction, look for signs of shill or automated bidding. Fake usernames are often unimaginative and artificial; “bidder14” or “suzysue” are something a bidbot might generate randomly. Very fast responses to your bids are another clue, although bidbots may be programmed to wait until just before time expires on an auction to bid and extend it. Like casinos, most penny auctions sites play by the rules, and don't use shills or bidbots. Those rules are designed to bring them huge profits, so there's little incentive for established penny auction sites to cheat. And after a few such sites were shut down by authorities, they know the law is watching. Most recent comments on "Penny Auctions: Scam or Legit?" Your description is clear, and with the exception of shilling bidbots, it all seems above board from a legal perspective, but it all screams SCAM to me regardless. I'll stick to eBay when I want to try to buy something on auction online. This penny auction stuff is for the birds. It's even worse when you finally find an item you really want -- along with a lot of other people who also really want it. You can easily blow through $50 worth of bids and not be the winner. From my experience, the only things you can actually "win" are things nobody else wants, or nobody else stays up late enough to bid on. One comment about QuiBids... at one time they had a lot of refurbished HP laptops. The descriptions stated that HP issued a new laptop warranty with each one. When both of the HP laptops I got failed within 2 weeks, HP would not honor the warranty because it was a refurbished product. I returned one for a refund. For the other I bought an extended warranty from HP because that was a little less expensive than buying a new hard drive. Because of the warranty, HP sent a tech to my house to replace the drive "at no cost." In the end, I wound up with a high-end laptop and managed to save a little off the price of buying it new. It was barely worth the aggravation. I have never bid in a penny auction so take my advice with a grain of salt. If I were to bid, here is how I would do it. 1) research on their site (if possible) what the item has gone for before. 2) never bid until the price gets close to previous selling prices. 3) know the interval between last bid and ending and watch the clock. 5) never bid more than a few times. Penny auctions are indeed thinly veiled gambling and I for one don't think they should be legal. I instinctively knew there had to be a catch to those auctions, and so stayed away from them, but didn't know how they actually worked. After reading your article, maybe we should start one up! Yes, I registered at MadBid way back in 2011. And I watched a few auctions before coming to exactly the same conclusion as you did Bob! Of course, I was only going on instinct and couldn't work out the possible figures as you have. But even so, I decided quite soon never to buy any bids and have not been back or tried any similar sites since! Because just imagine how many items you might have to bid on, paying however much for each block of bids, before you MIGHT one day be a 'Lucky Winner' and get 'a bargain'! No, I would rather not gamble a lot of money just to try and get one bargain, preferring to get lots of bargains at prices that you can actually see as the auction progresses, from eBay! That way, at least you can bid up to what you want to pay and then stop without it having cost you a penny! We considered starting a penny auction site a couple of years ago when they were new and hot. So did many others. What we learned is that to be a successful business you have to have lots of steady traffic. New sites with few "members" risk having few bids on items and thus having a high product cost but low purchase income, even with some bidders. It is only when the number of regular bidders is large that the company makes money... but then it can be a lot of money, as Bob illustrates. Many buyers try it, wise up, then drop out, so it is necessary for the business to come up with a steady stream of new, inexperienced buyers. A major expense is that advertising and promotion. New penny auctions start up and drop out almost daily, done in by these high up-front start-up costs. It would seem like a good idea, as a bidder, to look for new auctions and get in before they entice a lot of other bidders. Our observation is that most of these little start-ups rely on bots or friends to prevent you from getting deep bargains. Some go bust within weeks, taking the money but never shipping the products bought. A scam for all but the winner. I've never played. In 2002 I bought tickets to australia for my parents & with their offered option of putting a $1000 top bid, it came to exactly that & your explanation here about bidbots is what was on the back of my mind with how I perceived my bidding was handled, especially since there was no warning email telling me to check when the 'bidding' was coming close to my pre-said top amount. Rule 1: There ain't no free breakfast. Rule 2. There ain't no free lunch. Rule 3. There ain't no free dinner. I think they are legit as long as you know what you're getting. With each bid costing $0.60 or more, in an active auction with penny or so price increases for each bid, you can really end up paying a whole lot more than the "bid" would indicate. Many sites require you to bid before they reveal the current bid price. I saw people who lost hundreds on a #50.00 item. I first looked into penny auctions a couple years ago when it seemed like Ebay was moving out of the "auction" phase and into the on-line market phase (more "purchase now" things than "auction price") The first thing I looked up was the quibids (the most popular at the time) but when I read that (at the time) it was $.60 per bid I realized it was more of a scam then a deal...now I see where some of these penny auctions will "guarantee" you will when you first auction, which I can only guess (because I still refuse to join one of these sites)that the only way they can make this guarantee is if you bid in a "special auction" where there is nothing but useless junk and trinkets that nobody else wants. I still use ebay or amazon these days just because it seems way less stressful. Totally correct and clear explanation. If not a TOTAL rip, maybe 99%. I got sucked in once, and after spending about $40 of my $50 worth of bids, realized how rigged and hopeless it was -- and felt so ashamed and "soiled," that I won't even go back us use up my $10 remaining im bids -- yeah, I know it's my money . . . but someone, going back and spending it is like "letting the terorists win"! I have run into what you call shills. now and again I have experienced this, I would be bidding and out of the blue some what seemed to be fantom screen name would continuously out bid me immed,I did stay with it for 10-20 bids but could see this was a loosing proposition. I am tired of watching certain screen names time and time again bid on something until it gets to the pay now price. now you cant expect me to be that dumb that there are that many people that would out bid the buy now price. and anyone reading this needs to know that places like quibids are not an authorized retailer for many of these products and I have been screwed with the warranty part of some things I have purchased, there were 2 times that the items failed well under the warranty pertiod and they laughed at me when I told them where I bought it. the warranty is not honored unless purchased at one of their authorized retailers and quibids pertty much told me I was on my own, all they do is sell them and I didnt pay the full price to begin with ! ! argue with the manufacturer. dont waste any of your money. I've often seen these auctions, but never been tempted to participate. Definitely bears out the old maxim "If it looks too good to be true, then it almost certainly isn't true." Bob, Thanks for your assessment of penny auctions. I would agree with much of what you said - particularly the idea that there are risks when participating on these sites. However, to be fair, you should acknowledge that some penny auction websites offer a Buy Now option. This means that every bid you place is applied towards the purchase price of the item. For example, if you bid on a $25 gift card and you spend $25 worth of bids without winning, the site will let you order the gift card for $0. This concession makes bidding less risky. "the irony is the odds are probably better in Vegas than at a penny auction"
When you go to Vegas, you are playing against odds that you can't modify. When you play penny auctions, there are strategies and statistics that increase your odds of winning. These odds are much better than Vegas odds and are documented on websites like the Penny Auction List (which I manage) and All Penny Auctions (which I use in my own bidding). The bidders who lose in these auctions are bidders who don't do much research up front, or utilize an ineffective strategy. On the flipside, there are bidders who do very well. Thanks for hearing the other side. EDITOR'S NOTE: Thanks for presenting your case! Your strategy articles for the specific auction sites look like good resources for those who want to participate in penny auctions. JP you said you returned the product because it was defective. However, did Quibids return the money to the losers? In my mind this was not a legit auction. So how much money did Quibids make on the bad product after refunding your money? Once I read that people lose money on the penny auctions, I had no interest in even trying. I just considered it a gamblers haven and a rip off. There are many fraud penny auction sites on internet. But still there are some good reputed sites which work in a fair manner. We should choose a website very carefully. Thank You for sharing the information with us.